Yes there will be plenty opportunity on the daily or weekly time frames. Yes, they wont be as frequent as the shorter time frames (timewise) but they will appear in the same proportion. We believe in the "Science of Chaos". We believe the market is a product of chaos and a great example of fractal geometry. Think waves within waves within waves. If the market is fractal geometric then the frequency of trades per time frame will always remain the same. Let me try to explain this using analogy E.g. if an M1 chart creates a setup each set of 7 Candles/Bars that means the daily chart will also create a setup every 7 candles/bars. The only difference is that time wise a setup will appear every 7 min on an m1 chart but every 7 days on a daily chart. Check this Trade I just took on EUR/JPY. It took 15min to complete. Its a nice 1.5% account growth. A similar trade on Daily time frame would take 15 days and raise your account by 1.5%. Not bad I would say. 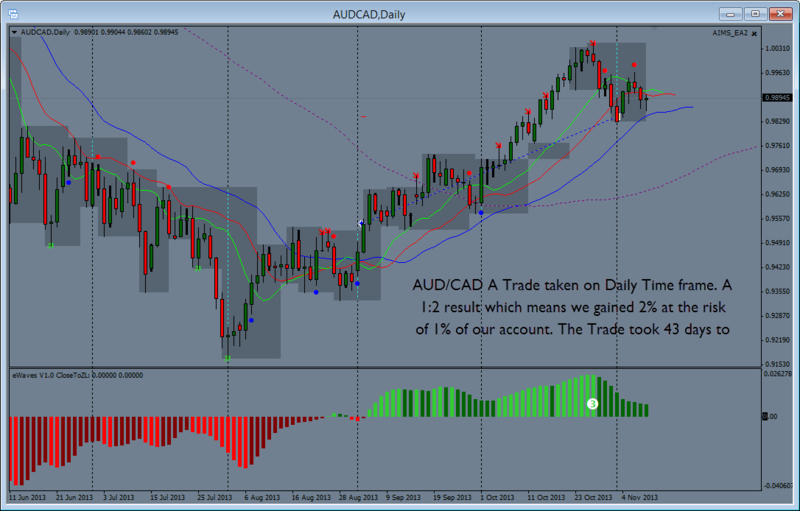 Here is an example of a recent trade on AUD/CAD on Daily Time frame. The trade was a 2% account growth on this entry but an overall over 5% trade (we add on using our techniques). The trade took 45 candles (i.e. days as its a D1 chart) to complete. We believe that if a Setup, a trading signal setup, does not apply to all time frames, if a trading technique does not apply in similar way to all the time frames, it is probably a false setup. It is not correct, it is not in line with the "structure of the market". We know the structure of the market. We believe the market is not "un-organised". Its not noise. It is highly organised and it has a structure. That structure is the same no matter what time frame you trade. IT works on ALL Time Frames, All Currencies and All Commodities and Stocks. You just have to find the "Courage" to trade it. Join Now to Find Out How to Trade in line with the Structure of the Market.